1 oz and 2 oz casting eggs, a technique developed long ago by the pioneers of Striped Bass fishing. the egg will float and have a "roly poly" action on top which attracts fish, then they see your fly etc and hit it! I will allow you to fish areas you normally can't due to excessive rocks etc. The eggs are very aerodynamic and cast very well! 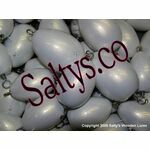 We've had these used worldwide on many different kinds of fish. Absolutely deadly technique! Instructions/pictorial on each page.